The Paris authorities are planning to ban smoking in public parks from the autumn in the latest effort to cure the French of their addiction to cigarettes and cut down on litter. A trial ban is being imposed this summer in four parks, and the mayor plans to extend it to all city parks within months. A ban in the eastern city of Strasbourg came into force this week, and three years ago Paris banned smoking in children’s playgrounds. Laurence Goldgrab, a Paris councillor, said the ban was motivated by public hygiene as well as public health. Smokers tend to leave cigarette ends lying on the ground and some 350 tons of butts were collected last year. “In 2017, the city issued nearly 21,000 fines to smokers who left their cigarette ends on the ground,” she said. Throwing a cigarette end on the ground will incur a €68 (£60) fine, while fines have been set at €450 for smoking in a proscribed public areas. There will also be a hefty €750 penalty for smoking in a car with a minor. 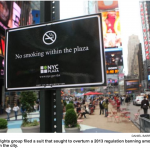 France is not the only country trying to banish smoking from public spaces. A number of US cities have banned smoking in parks. It is also banned in Australia’s national parks and some beaches. A 2014 public health review in London ordered by the then mayor Boris Johnson, recommended banning smoking in parks and public squares. The French are among Europe’s heaviest smokers, but the government has campaigned against tobacco and imposed hefty price increases to try to stub out the image of the fashionable French puffing on cigarettes at pavement cafés. The number of people lighting up daily has fallen sharply, with a million people kicking the habit last year, a survey suggests. Nevertheless, France still has up to 50 per cent more smokers than Britain, although it has introduced plain cigarette packaging and many smokers have turned to e-cigarettes.